SILICON VALLEY, CA--(Marketwired - Oct 10, 2013) - Punchh, a leader in mobile CRM for the restaurant industry, announced a new product to further expand its market leadership position and that it hired Jonathan Fornaci as its new chief operating officer (COO) to accelerate growth in the $20 billion U.S. restaurant marketing segment. Punchh's founders, investors, and advisors worked with CRM pioneer Siebel Systems. With its next-generation Mobile CRM Suite, Punchh helps brick and mortar businesses know their customers, bring them back and get new customers by tapping into their customers' word of mouth. Punchh's technology takes advantage of four key trends: cloud, mobile, social media, and big data technology adoption by consumers and businesses. Announces Big Data Customer Segmentation™ Punchh's mobile CRM suite is already the most comprehensive in the market. Today Punchh is launching Big Data Customer Segmentation™. With this new capability, restaurants can not only get a deep understanding of their customers through demographics, frequency, spend, orders, social media reviews, and referrals but can also create and target micro-segments, based on ordered items SKU/PLU, spend, and other demographic and behavioral characteristics. "Until now, big data analytics has mostly been about tools for large companies with big budgets," said Jitendra Gupta, founder and CEO of Punchh. "We are making big data just work for brick and mortar businesses, without requiring them to be IT savvy or data scientists. Restaurant CEOs and CMOs can view actionable insights about their customers in real-time." Within minutes, a restaurant CMO can drill down into store or customer-level insights, create micro-segments of their customers, and target them directly on their smartphones with personalized offers. For example, he/she can quickly identify which of the customers order a turkey avocado sandwich, and send them an offer for adding potato chips. Today Punchh is also announcing that Jonathan Fornaci is joining as COO. In the last 6 months, Punchh has grown 300% and now has 31 employees. Mr. Gupta said, "Jonathan is one of the strongest restaurant industry executives with a unique mix of industry expertise and vision for how mobile can transform restaurants. He has led two iconic brands including Straw Hat Pizza and Rita's Italian Ice, which is also a key customer of Punchh." "Having a key customer's executive join us is a testament to our market leadership and the results that we deliver for our customers. With his addition to our leadership team, we look to accelerate our momentum by tapping into the big demand we are seeing," said Mr. Gupta. 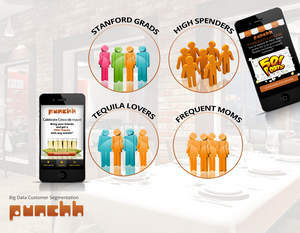 Punchh's new chief operating officer Jonathan Fornaci said, "Punchh is addressing a huge market and a key problem that most restaurants are struggling with: knowing who their customers are, and targeting them with personalized offers to bring them and their friends back. At Rita's Italian Ice, Punchh helped us launch the Rita's Rewards mobile app, which helped us really understand who our customers are. We realized a triple-digit ROI through the Punchh solution." "I'm thrilled to join Punchh and I believed in the results so much that I personally invested in the company. I think that we can make a terrific impact for many other brands and industries in addition to restaurants," said Mr. Fornaci. 10-15x more customer reviews than Yelp! About this company Punchh, Inc.
Today Punchh is launching Big Data Customer SegmentationTM.